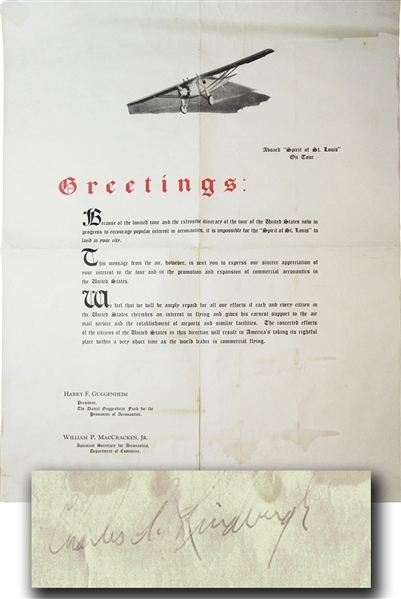 Signed Poster, 22" x 28," with a fantastic image of the "Spirit of St. Louis," along with its salutation and indirect apology - "Because of the limited time.....it is impossible for the 'Spirit of St. Louis' to land in your city." Large 3.25" signature, "Charles A. Lindbergh," somewhat faded but legible, but more than valuable as a relic. Lightly toned with faded damp staining to the bottom of the poster. Expected folds, with supportive archival tape to verso along 6" of a fold line. Mounting remnants to verso. With its designated purpose being the generation of increased public interest in, and support of, aviation, Lindbergh and "The Spirit of St. Louis" visited 48 states and landed in 92 cities from July 20 through October 23, 1927. As his tour was not able to land in every city, intermittently he would fly under a 1000 feet over fans dropping a poster such as this one from his plane, loaded into a canvas tube.